Srinagar: In a first a protest march was held in the Afghanistan capital city Kabul in solidarity with the people of Kashmir. Multiple media reports said that scores of Hazara and Tajik women marched the streets of Kabul raising slogans in favour of Kashmir and against India. The reports said that the protesting women denounced the killings in Kashmir. 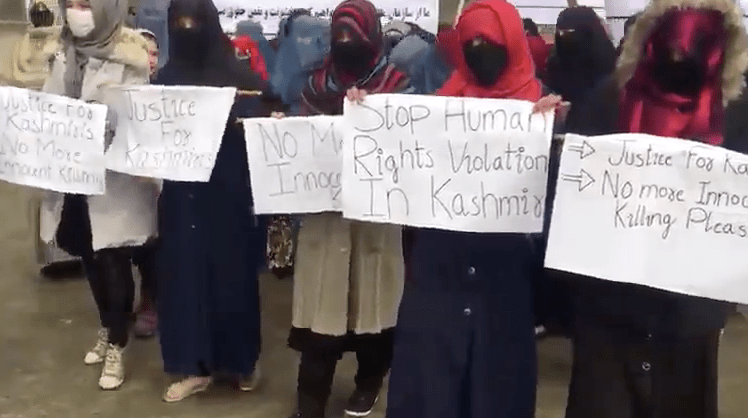 “They were also carrying banners and placards inscribed with slogans in support of freedom struggle of Kashmir,” the reports said. They demanded that the genocide of innocent Kashmiris and blatant violations of their fundamental rights be stopped. Pertinently, Pakistan today observed “Kashmir Solidarity Day” to express support with the people of Kahsmir. Several programs were held at various places and cities around the world including in Greece, London and other places.